Generics and Biosimilars Initiative Journal (GaBI Journal). 2017;6(4):185-7. Cinfa Biotech, the biosimilars specialists of the Cinfa Group, reviewed pegfilgrastim biosimilar approaches to treat chemotherapy-induced neutropenia. Professor Dr Gascón discussed ’perspectives of pegfilgrastim’ and Dr Roth and Dr Jankowsky discussed why biosimilars are vital for oncology care. The current discussion regarding biosimilars in oncology focuses on primary treatment, for example, in monoclonal antibodies such as trastuzumab (Herceptin®), rituximab (Rituxan®) or bevacizumab (Avastin®) to treat a range of cancers. However, there is also strong medical need for affordable treatment options in supportive cancer care. Pegfilgrastim, a PEGylated form of recombinant human granulocyte colony-stimulating factor (G-CSF) analogue filgrastim, is a vital instrument in cancer care that decreases the risk of febrile neutropenia (FN) thereby limiting dose-reductions or delays in chemotherapy. In comparison to filgrastim, pegfilgrastim provides important medical advantages, such as a 42% relative decrease in the incidence of febrile neutropenia. Future pegfilgrastim biosimilars will provide better access to this treatment option. On 11 October 2017, Cinfa Biotech, biosimilars company of the Cinfa Group, held an international webcast to discuss the perspectives of pegfilgrastim and to present the development programme of its proposed pegfilgrastim biosimilar B12019. Professor Pere Gascón (Senior Consultant, Department of Haematology & Oncology, Hospital Clinic of Barcelona, Spain) gave a talk on the better management of neutropenic cancer patients. Dr Ruediger Jankowsky, (Managing Director, Cinfa Biotech), introduced Cinfa Biotech, the biosimilars company of the Spanish Cinfa Group. Dr Karsten Roth (Director Clinical Operations, Cinfa Biotech) presented the B12019 clinical development programme, being the basis of the marketing authorization application (MAA) submitted to the European Medicines Agency (EMA) in September 2017. Because bone marrow cells multiply even faster than tumour cells, bone marrow-derived neutrophils are highly sensitive to chemotherapy. Chemotherapy can cause FN with severe complications in both the short and long term. Neutropenic patients are highly susceptible to infections . Febrile neutropenia is potentially life threatening, requiring immediate hospitalization and antibiotic treatments . A study of discharge records from 41,779 adult cancer patients admitted to hospital for FN, showed overall inpatient mortality to be 9.5% . The risk of mortality increased significantly for patients with additional co-morbidities. A frequent response to neutropenia is to reduce or delay subsequent chemotherapy, resulting in reduced relative dose intensity (RDI) and leading to less effective chemotherapy, impacting negatively on patient outcomes [3, 4]. Consequently, neutropenia frequently results in reduced survival. Granulocyte colony-stimulating factors (G-CSF) are a naturally occurring growth factor that regulates production of neutrophils within bone marrow and enhances neutrophil progenitor proliferation, differentiation and selected end-cell functional activation. Under normal conditions the proliferation, differentiation and maturation of neutrophils in the bone marrow takes almost three weeks. With the administration of G-CSF therapy, cell maturation is both amplified and occurs more quickly (in 1 day instead of 4–5 days). Cells released following G-CSF therapy show function equal to or greater than that of cells released because of neutrophil development without G-CSF treatment [5, 6]. Professor Gascón commented: ‘People are not aware that G-CSF not only increases the quantity of neutrophils but also the quality’. Data from a placebo-controlled study of 211 patients with small-cell lung cancer shows that G-CSF decreases the intensity and duration of severe neutropenia . Patients treated with G-CSF experienced a reduced nadir, i.e. a reduction in the severity of neutropenia; a shorter duration of severe neutropenia (1 day instead of 6); and faster recovery of absolute neutrophil count (ANC). In this presentation, Professor Gascón pointed out that these results are important and significant because the risk of infection is directly related to both the severity and the duration of chemotherapy-induced neutropenia, both of which are reduced with G-CSF. Currently, EORTC (European Organisation for Research and Treatment of Cancer) [7, 8], ASCO (American Society of Clinical Oncology)  and NCCN (National Comprehensive Cancer Network)  guidelines recommend primary prophylaxis with G-CSF in patients with a ≥ 20% risk of FN. Different pharmaceutical versions of G-CSF are available, the most widely used are short-acting filgrastim and long-acting pegfilgrastim. The main difference between filgrastim and pegfilgrastim is based on the clearance of the molecule in the body. Clearance of filgrastim is mediated by glomerular filtration and excretion in urine. It is metabolized by binding to its receptor, which is present mainly on mature neutrophils and their precursors, plus subsequent internalization. Pegfilgrastim is formed by the addition of a polyethylene glycol (PEG) group to the N-terminus of filgrastim. The PEGylation results in a large molecule and prevents renal clearance. Elimination occurs predominantly via neutrophil-mediated clearance, resulting in a self-regulating clearance mechanism. Pegfilgrastim concentration remains elevated in the plasma until neutrophil levels increase. As Professor Gascón noted: ‘Neutrophils behave as a control for their own. Therefore, we will never have the leukemoid reaction that we used to see with filgrastim’. 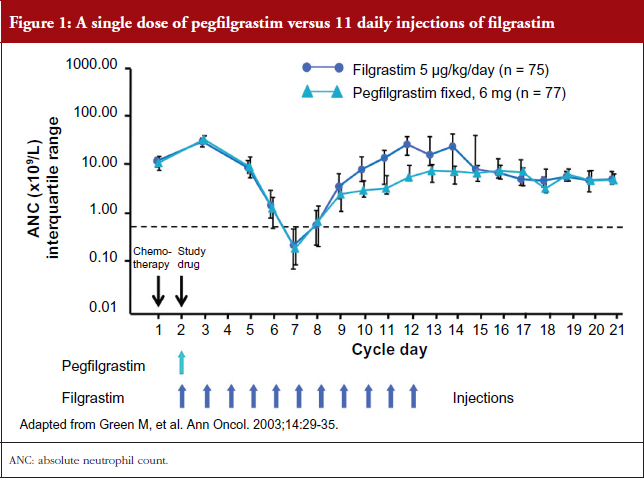 In addition, a single dose of pegfilgrastim administered once per cycle of chemotherapy is comparable to 11 daily injections of filgrastim in safely providing neutrophil support during myelosuppressive chemotherapy as shown in a clinical study by Green et al. , see Figure 1. 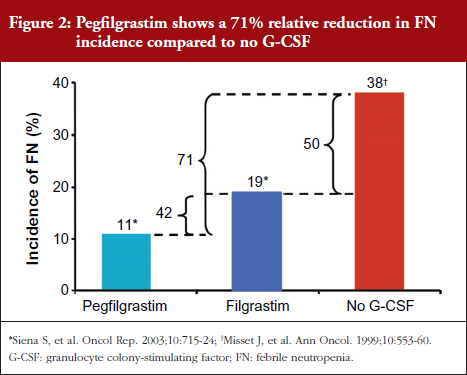 The combined analysis of two filgrastim versus pegfilgrastim trials demonstrated an 11% decrease in FN for pegfilgrastim and 19% decrease for filgrastim compared to no G-CSF representing a 42% relative decrease in the incidence of FN for pegfilgrastim compared with filgrastim . This is similar to that seen in the original pivotal trial of filgrastim versus placebo in patients receiving chemotherapy for small-cell lung cancer . The relative difference in incidence of FN between filgrastim and no cytokine support was 50% (19% vs 38%, respectively) . Therefore, the reduction with the use of pegfilgrastim suggests a relative 71% overall reduction in FN incidence compared with no treatment, see Figure 2. Note: a direct comparison has not been performed. Professor Gascón summed up his talk by showing the necessity for pegfilgrastim in oncology and the perspectives of pegfilgrastim biosimilars. Pegfilgrastim biosimilars might provide better access to pegfilgrastim for patients and physicians. With the broader use of pegfilgrastim in oncology, Professor Gascón expects lower incidence of FN, better allowance of dose intense treatments and prevention of treatment delays. ‘This could lead to less total treatment costs due to reduced short- and long-term complications’, he noted. Pegfilgrastim biosimilars are currently developed by different biosimilar companies. Cinfa Biotech submitted an MAA for its pegfilgrastim biosimilar B12019 to EMA in September 2017. Dr Roth provided an overview on Cinfa Biotech’s B12019 development programme. The programme was based on a step-wise approach. Biosimilarity was established by comparative quality data, followed by non-clinical studies for the investigation of biosimilarity. For the confirmation of the analytical and bifunctional similarity of B12019 and Neulasta®, a clinical programme, based on scientific advice from EMA, was conducted in highly sensitive clinical study settings. The clinical programme included two clinical studies, both conducted in healthy volunteers rather than cancer patients. Healthy volunteers are the most sensitive model to evaluate pharmacokinetics (PKs) and immunogenicity. In addition, pegfilgrastim benefits from having a validated biomarker for efficacy, ANC, which can be sensitively tested in healthy volunteers. 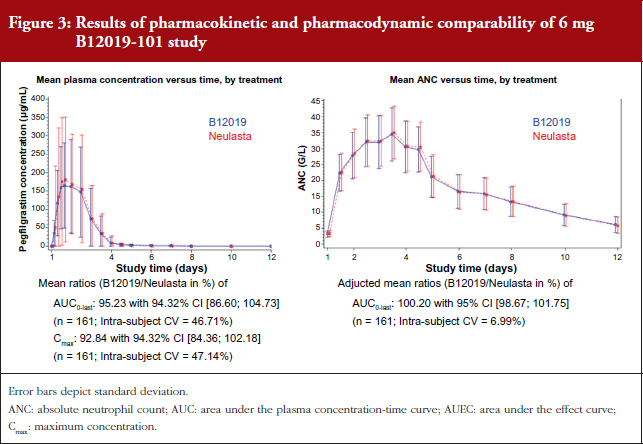 The pivotal study B12019-101 examined PK and pharmacodynamic (PD) comparability of 6 mg B12019 to 6 mg Neulasta®, see Figure 3. The single-dose, randomized, double-blind, two-way crossover study enrolled 172 healthy volunteers. The primary endpoints were the area under the plasma concentration-time curve (AUC) and the maximum concentration (Cmax) for PK and the area under the effect curve (AUEC) for ANC for PD. The supportive study B12019-102 examined immunogenicity and PD comparability of 3 mg B12019 and 3 mg Neulasta® in a multiple-dose, randomized, double-blind, three-period, two-sequence crossover study in 96 healthy volunteers. Primary endpoints were AUEC for PD and anti-drug antibody rate (ADA) for immunogenicity. All clinical endpoints were met in both studies. In clinical trial B12019-101, using the clinical dose of 6 mg, B12019 met the co-primary PK and PD endpoints and did not show any statistically significant PK and PD differences to Neulasta® (compare also Roth, et al. Blood. Dec 2016 ). In study B12019-102 PD comparability was demonstrated while using a dose of 3 mg. The AUEC0-last geometric mean ratio was within the pre-specified acceptance range. In both studies, no imbalance of ADA-positive samples after single or repeated dosing was observed. Neither anti-G-CSF nor neutralizing antibodies were detected for B12019 or Neulasta®. Dr Roth concluded his overview, that the safety and immunogenicity profile did not show any clinically meaningful differences between B12019 and Neulasta®. Dr Jankowsky summarized the presentations noting that ‘the current discussion on biosimilars in oncology is mainly focused on primary treatments such as monoclonal antibodies. This webinar has demonstrated the strong medical need also for supportive treatments, for instance pegfilgrastim in the management of chemotherapy-induced neutropenia’. In addition, he pointed out the more general need for affordable treatment options, in primary and secondary oncology, which could be addressed with biosimilar drugs. An important outcome of the webinar was that pegfilgrastim provides many medical advantages over filgrastim as a neutropenia treatment. Having met all clinical endpoints of both recent studies, B12019 is a promising candidate for approval. Cinfa Biotech has recently reported acceptance of the MAA for biosimilar B12019 by EMA to treat neutropenia. The authors would like to thank Ms Julia von Hummel, MSc, and Mr Shaun Whishaw-Brown, MSc, of MC Services GmbH in preparing this meeting report. Disclosure of financial and competing interest: The webinar was organized by Cinfa Biotech SL, the biosimilars company of Cinfa Group (Pamplona, Spain) and broadcast from Munich, Germany. The speakers received payments for their participation in the webinar. Professor Pere Gascón has been the key opinion leader on the ‘Perspectives on the Future of Pegfilgrastim Biosimilars’ webinar. Professor Pere Gascón has participated in the advisory boards of Cinfa Biotech, Mylan, Pfizer, Sandoz and Teva. 1. Bosly A, Bron D, Van Hoof A, De Bock R, Berneman Z, Ferrant A, et al. Achievement of optimal average relative dose intensity and correlation with survival in diffuse large B-cell lymphoma patients treated with CHOP. Ann Hematol. 2008;87(4):277-83. 2. Kuderer NM, Dale DC, Crawford J, Cosler LE, Lyman GH. Mortality, morbidity, and cost associated with febrile neutropenia in adult cancer patient. Cancer. 2006;106(10):2258-66. 3. Lyman GH. Impact of chemotherapy dose intensity on cancer patient outcomes. J Natl Compr Canc Netw. 2009;7(1):99-108. 4. Chirivella I, Bermejo B, Insa A, Pérez-Fidalgo A, Magro A, Rosello S, et al. Optimal delivery of anthracycline-based chemotherapy in the adjuvant setting improves outcome of breast cancer patients. Breast Cancer Res Treat. 2009;114(3):479-84. 5. Lüftner D, Possinger K. Pegfilgrastim – rational drug design for the management of chemotherapy-induced neutropenia. Onkologie. 2005;28(11):595-602. 6. Crawford J, Ozer H, Stoller R, Johnson D, Lyman G, Tabbara I, et al. Reduction by granulocyte colony-stimulating factor of fever and neutropenia induced by chemotherapy in patients with small-cell lung cancer. N Engl J Med. 1991;325(3):164-70. 7. Aapro MS, Cameron DA, Pettengell R, Bohlius J, Crawford J, Ellis M, et al. EORTC guidelines for the use of granulocyte-colony stimulating factor to reduce the incidence of chemotherapy-induced febrile neutropenia in adult patients with lymphomas and solid tumours. Eur J Cancer. 2006;42(15):2433-53. 8. Aapro MS, Bohlius J, Cameron DA, Dal Lago L, Donnelly JP, Kearney N, et al. 2010 update of EORTC guidelines for the use of granulocyte-colony stimulating factor to reduce the incidence of chemotherapy-induced febrile neutropenia in adult patients with lymphoproliferative disorders and solid tumours. Eur J Cancer. 2011 Jan;47(1):8-32. doi:10.1016/j.ejca.2010.10.013. 9. Smith TJ, Khatcheressian J, Lyman GH, Ozer H, Armitage JO, Balducci L, et al. 2006 update of recommendations for the use of white blood cell growth factors: an evidence-based clinical practice guideline. J Clin Oncol. 2006;24(19):3187-205. 11. Green MD, Koelbl H, Baselga J, Galid A, Guillem V, Gascon P, et al. A randomized double-blind multicenter phase III study of fixed-dose single-administration pegfilgrastim versus daily filgrastim in patients receiving myelosuppressive chemotherapy. Ann Oncol. 2003;14(1):29-35. 12. Siena S, Piccart MJ, Holmes FA, Glaspy J, Hackett J, Renwick JJ. A combined analysis of two pivotal randomized trials of a single dose of pegfilgrastim per chemotherapy cycle and daily Filgrastim in patients with stage II–IV breast cancer. Oncol Rep. 2003;10(3):715-24. 13. Misset JL, Dieras V, Gruia G, Bourgeois H, Cvitkovic E, Kalla S, Bozec L, Beuzeboc P, et al. Dose-finding study of docetaxel and doxorubicin in first-line treatment of patients with metastatic breast cancer. Ann Oncol. 1999;10(5):553-60. 14. Roth K, Gastl B, Lehnick D, Jacob K, Jankowsky R. Demonstration of pharmacokinetic and pharmacodynamic equivalence in healthy volunteers for B12019, a new proposed pegfilgrastim biosimilar. Blood. 2016;128(22):5079.